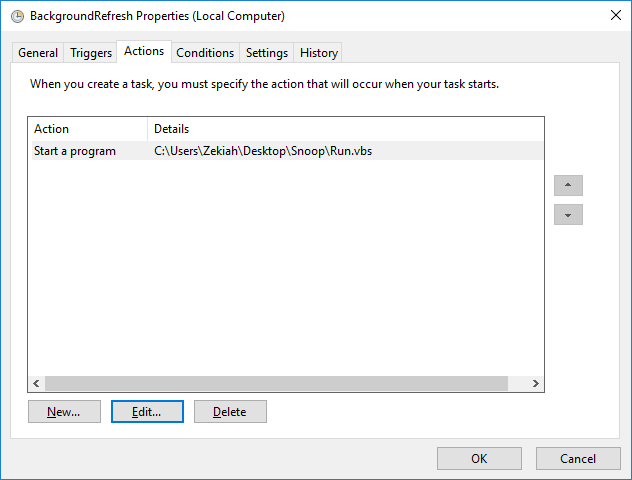 Scheduled Task Running – Zekiah Technologies, Inc. I like to think that I learn more every day, but I still really embrace being a computer novice in a lot of ways. About four years ago, I learned about using Windows’ Task Scheduler to run processes on a defined timetable. The typical things it became useful for in my daily activities were: backing up data from my local machine to a server, running processes during off-hours that consume significant system resources, and automating web download workflows/preparing the data before I arrived at work. It’s best for uses requiring no user input, since the user is often absent during a scheduled task run. 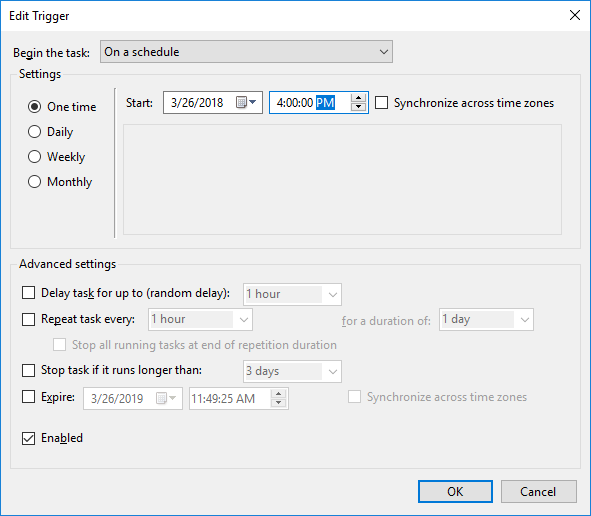 If you are unfamiliar with this process, there can be fun and simple ways of figuring out how to use the Task Scheduler, and the logic applied will eventually help you automate legitimate work processes. I promise! My typical scheduled task workflow goes as follows: create a python script that runs the process you’d like to complete, create ‘.bat’ file that points to the python script, and schedule a task in the Task Scheduler that runs the ‘.bat’ file at a specified time of day. It essentially loops through the specified desktop directory adding all ‘.jpg’ files to a list. Once done, it loops through that list and changes the desktop wallpaper, waits half a second, then repeats until it has gone through all files in the list. “@echo off” produces no statements when the command window launches and “exit /b” exits the batch file. 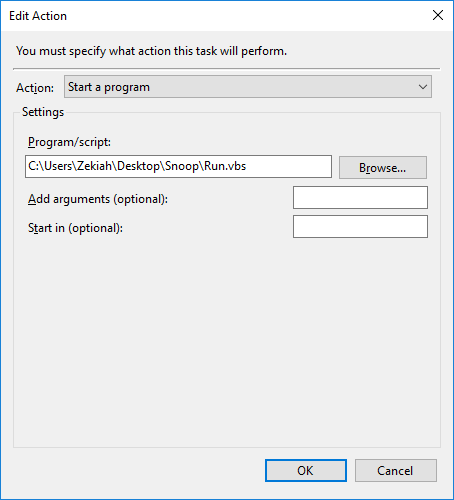 strArgs = "cmd /c C:\Users\Zekiah\Desktop\Snoop\ChangeWallpaper.py"
And that’s pretty much it unless you want to specify some additional advanced parameters. As it sits right now, the Task Scheduler will run ‘Run.vbs’, which runs ‘ChangeWallpaper.py’ every day at the specified time. 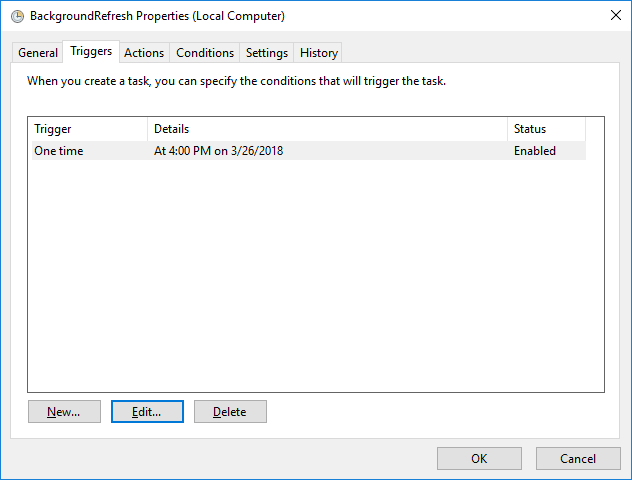 You can run it on demand within the Task Scheduler as well to confirm its functionality. Hope this logic will help give you some ideas about processes that would be worth automating using the Task Scheduler! This post was written by Christian. Contact us for more information on this post or our services. Why work at Zekiah Technologies? We have extensive experience developing and integrating software systems that assist in running your business. As part of our philosophy of intelligent technology consulting, we not only believe that information technology has the capability to realize efficiencies in your business processes but we also believe that such technology should only be applied only when benefits outweigh the cost of developing and maintaining the technology itself.